Some birds flock. Some birds don’t. Several hummingbirds may appear at a feeder, but they are definitely not a flock. Robins flock in winter, but in breeding season form territorial pairs. Ditto swans. Starlings, however, are rarely seen singly, and the same applies to flamingos. Other species gather in large groups to roost at night (crows) or only when migrating (sandhill cranes). In flight, being in groups has several benefits. 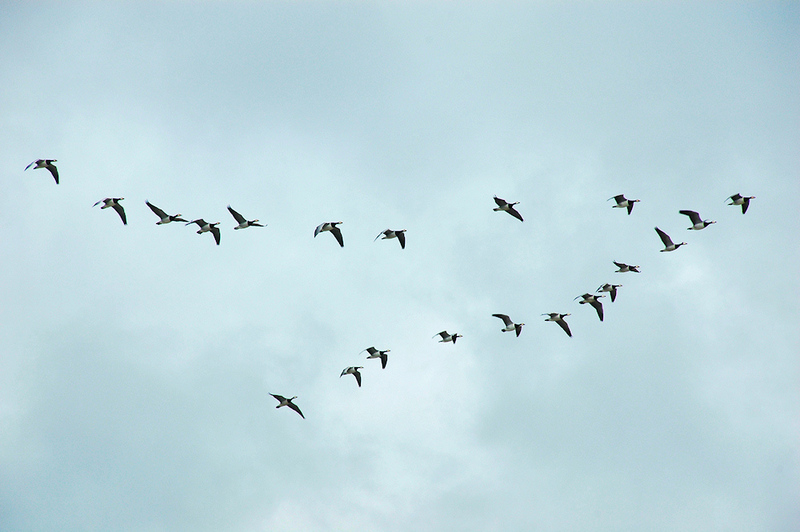 Geese form lines diagonal to flight direction, sometimes a “V” formation with one bird in the lead and lines trailing on both sides, because the air disturbance coming off the lead bird’s wings enables the trailing bird to expend less energy. When feeding in groups, one or more birds are always pausing to watch for predators, either the fox on the ground or the diving hawk. Warning sounds and sudden movement by these observers triggers mass evasion by the rest of the flock. In the air or on the ground, being in a group can also hinder a predator from targeting and pursuing one individual bird out of the flock. Group behavior is seen in species other than birds. Fish school. Mammals form herds. There is a saying about being on a hike in bear country: “You don’t have to run faster than the bear to get away. You just have to run faster than the guy next to you.” Generalized to herd behavior, the best strategy against a predator is to put another individual between you and the predator. A grouping may be somewhat scattered to feed, but cluster inward when predators approach, as each individual tries to move to the center. If the grouping has a familial relationship, vulnerable young may be moved to the center while adults form a protective barrier. Think musk ox or elephants. Roosting at night, the birds were so densely gathered as to break the limbs off trees, and in areas where they nested, droppings piled up a foot thick, poisoning ground plants, and in time, the nesting trees. The birds moved on. Passenger pigeons, more than other flocking bird species, depended on predator satiation, and so were not able to adapt to human harvesting. The end came quickly. Circa mid-1800s, market hunters used shotguns, nets, whiskey-soaked corn and so on to bring birds to ground. Birds were plucked, gutted, cooked, salted and packed into barrels, to be shipped by railroad to the fast-growing cities of the Industrial Age. Their meat ended up in pigeon pie (think today’s meat pies). At the nesting sites, ground fires would be lit when the nestling squabs were nearing adult weight but not yet able to fly. The squabs would fall to the ground, stunned, to be picked up by hand. As flocks vanished from the usual places, telegraph messages would go out about newly found locations. Market hunters followed. Locally, Henry David Thoreau’s journal from 1851 recounts a visit to a ‘pigeon-place’ where birds were lured in by trees for perching (live decoy birds tied to the branches), then netted. 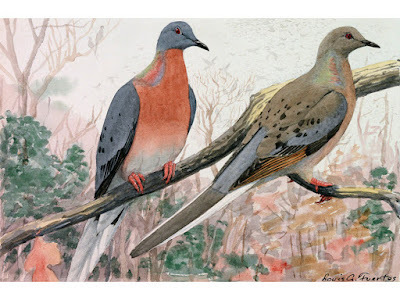 The last birds seen in the east were early 1890s, the last wild bird shot anywhere 1902, the last surviving bird died in a Cincinnati zoo, September 1, 1914. From billions to zero in fifty years. From 1922 to 2013 the imposing wooden building at 100 Main Street, currently housing 5 PEAKS Fitness (until recently, Legends Comix and Games), Classic Hair, Siam Village and Boston Bean on the first floor, Concord School of Taekwon-Do above, was known as the Masonic Building. when it was still the Masonic Building. The Charles A. Welch Lodge (http://www.charlesawelch.com/), founded by Welch in 1872, has since ceased to be housed in Maynard. Meetings were initially held at the Darling Block, a building on the northeast corner of Nason and Summer Streets. The lodge moved into the Main Street building in 1888 – the Maynard Block – but after the Masonic Corporation bought it in 1922, renamed the Masonic Building. The Freemasons occupied the top floor and rented out the rest. The primary reason for selling the building in 2013 was the high valuation and hence high property taxes set by the Town of Maynard. The actual sale price was below the town's assessment. The Lodge continues to meet as Maynard's lodge, meetings held at the Masonic Corinthian Lodge, 58 Monument Square, Concord. The Corinthian Lodge was chartered in 1797 – by Paul Revere. Concord’s building (built 1820) serves as host to other fraternal organizations in addition to Maynard’s group. For those not familiar with Freemasonry, the initials A.F. & A.M. (see photo) stand for Ancient Free and Accepted Masons. All lodges in Massachusetts are A.F. & A.M., as that was the designation of the initial colonial Grand Lodge, in Boston, in 1733. In some states the term is F. & A.M. (Free and Accepted Masons). The difference is a carry-over from a 1700s schism among England's Masons into Ancient and Modern. The separation has long since been resolved. States' Grand Lodges and their member lodges recognize each other’s members as true Freemasons. An important point here is that Freemasonry is not a beneficial fraternal order. Many of the nineteenth century organizations were created in part to pool resources of members so as to provide life insurance and other benefits. Some even owned cemetery burial plots for members and their families. Masonic charity is directed toward those who have met with misfortune, but in no way limited or preferential to members. Society holding the first petition to create a new town. There is a small but interesting story linking Maynard’s Masons to the history of the creation of Maynard. In their possession was an original, never-submitted, petition to create a new town. This predated the official ‘Fowler’ petition of January 1871. In it, the town-to-be did not yet have a name and it called for some land to be taken from Acton and Concord in addition to Sudbury and Stow. How it came into possession of the Lodge is an unplumbed mystery, although there was a note that many of signers had been Masons. Lodge member Frederick S. Johnson was arranging to transfer it to the Maynard Historical Society in 2013 when he died, leaving the document’s location unknown. The task fell to his nephew, John Taylor III, who lived in Mansfield but had a family history with Maynard (his grandfather had owned the mink farm off of Concord Street). The framed document was given to the historical society on March 12, 2014. Of Maynard’s many, many beneficial fraternal orders of the nineteenth and twentieth centuries, only the Masons and Elks, smaller now, survive. The same attrition has occurred nationwide – a diminishing of local social groups as a consequence of an increasing mobile society. Same for churches. Same for bowling leagues for that matter. Robert Putnam’s book, “Bowling Alone,” describes the disintegration of our social networks, and the consequences on our physical and mental health of living a less connected life. April will be a perfect time to visit the Marble Farm historic site, as hundreds of daffodils will be in bloom. The trip involves a walk north on the Assabet River Rail Trail to a location just south of the Maynard/Acton border. As for this site’s history, start with a witch trial. In 1692, Joseph Marble, resident of Andover, Massachusetts, posted bond for his two nieces, accused of witchcraft. Abigail Faulkner, their mother, had already been convicted of witchcraft and sentenced to be hanged. Her execution was deferred because she was pregnant. By the spring of 1693 the witch hunt frenzy was over. Abigail was pardoned, her daughters never brought to trial. Locally, records show Joseph Marble buying 140 acres of land in Sudbury in 1704. Exactly what land he bought and from whom has not been confirmed, but a good guess is from William Brown and at the northeast edge of what is now Maynard. Joseph is recorded as attending Sudbury town meetings. Joseph’s son John and his neighbors petitioned to switch their land to Stow in 1730. 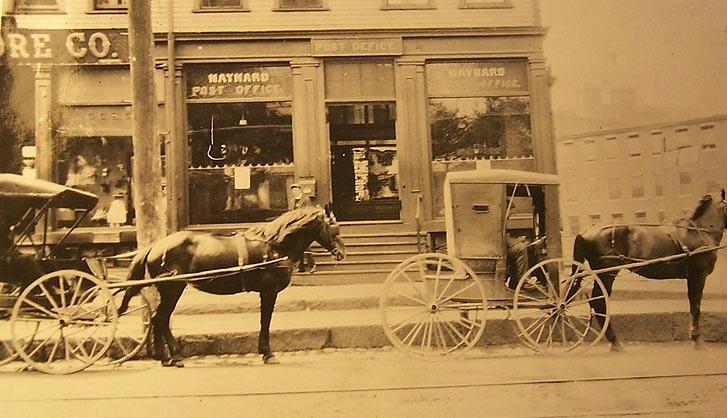 In 1871 the same land was included in the creation of Maynard, carved out of parts of Stow and Sudbury. Thus, over the years the homestead was located in three towns. The family line at the homestead was as follows: Joseph Marble, then his son John, John’s son John, and that John’s son, John. (Whew!) John-the-last is buried in Glendale cemetery with his wife Lois. Their daughter Sarah Marble married Daniel Whitney and they inherited the house. Their daughter Mary Whitney married Joel Parmenter. Mary and Joel lived in Sudbury until Daniel Whitney died in 1871, then back to the homestead, making it the Parmenter house until Joel died in 1919. Mary’s and Joel’s son Harry owned only half of the house and none of the farm at the time the house burned to the ground in 1924. The house was never rebuilt and the barns (spared by the fire) are long gone. The land is owned by the town of Maynard. A few highlights: The original immigrants John and Judith Marble, John and Elinor Whitney and John and Briget Parmenter, all arrived in New England in the 1630’s as part of the Puritan Great Migration. Joseph’s “witch” sister-in-law gave birth to Ammi Ruhamah Faulkner in 1693. His name was derived from Hebrew and translates as “my people have been saved” – apt for a child whose pregnancy saved his mother’s life! Around 1740 Ammi moved to South Acton and bought the mill. His home is now the historic Faulkner Homestead. His first cousin John Marble was already in residence at the Marble homestead, a mile down the road. Whitneys were early inhabitants of Stow; Parmenters early inhabitants of Sudbury. The site consists of a 28’ x 32’ house foundation and surrounding stone walls. In April 2009 Maynard’s Boy Scout Troop #130 cleared the site and installed a post and chain fence around part of the foundation. The east border is a walled ditch running parallel to the Assabet River Rail Trail. A historic plaque marks the site. The house burned on April 2, 1924. The nearest fire hydrant was too far away to be of any use. From clearing some of the debris that had partially filled the foundation over the years, the original basement floor appears to have been a layer of sand, on top of which was a thin off-white layer, possibly plaster or crushed limestone, topped by wooden planks. The last were scorched to charcoal by the fire. Uncovering the planks released a fleeting scent of the fire of 87 years ago. Marble Farm was the topic of a presentation to the Maynard Historical Society in 2009. In attendance were two descendants of Joseph Marble! Charles Marble was a descendant of John, one of Joseph’s sons. Sally Wadman, maiden name Chandler descended from one of Joseph’s other sons – Edmund – who had married Mary Jewell in August 1711.Their daughter Dorothy married Moses Chandler in 1742, and through their son, Samuel Chandler, reached down through eight more generations to Sally. Chandler is another New England name dating its arrival to the early 1600’s, in this case to a William Chandler who arrived around 1637. Thus, through Sally’s genealogical research she was able to connect with her Marble, Jewell and Chandler ancestors who all arrived within 20 years of the Mayflower. David Mark with daffodil sculpture for "Trail of Flowers"
Present-day, much of the site is overgrown again with Oriental bittersweet, sumac, blackberry and Japanese knotweed. Dead trees have fallen or are threatening. Volunteers cleared a portion between the foundation and the rail trail this summer past and planted grass. In October, more than 1,000 daffodils were planted. 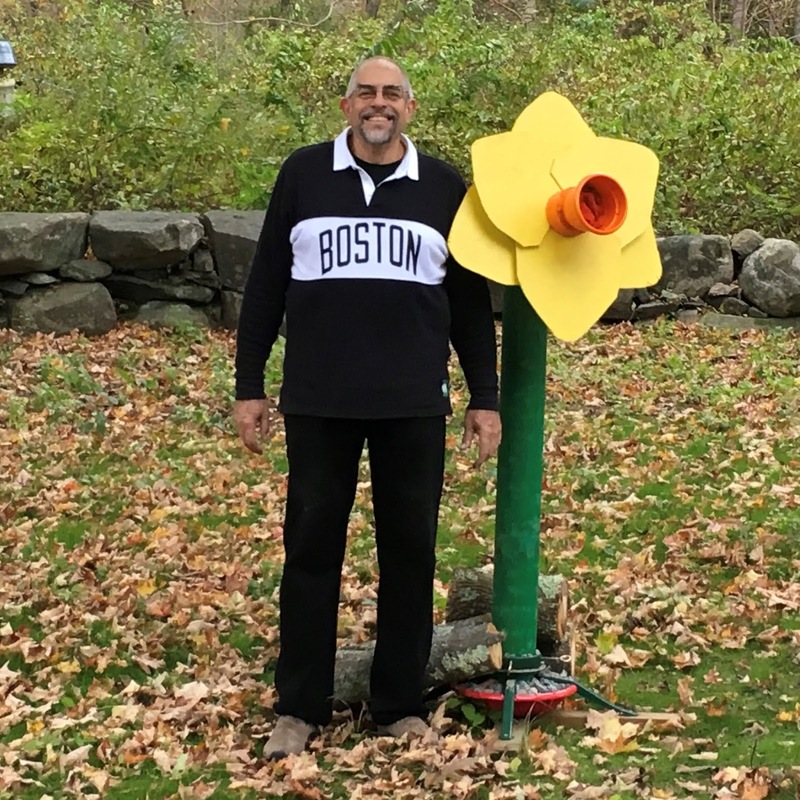 This was the first step toward converting Maynard’s portion of the Assabet River Rail Trail into a “Trail of Flowers.” The project will continue in 2019 with more mass plantings, and people whose property abuts the trail will be invited to put flowering plants at the back of their yards. A website to this effect trailofflowers.com will be launched later this year. Parts of this column saw print in 2010 (Mark’s ninth column). 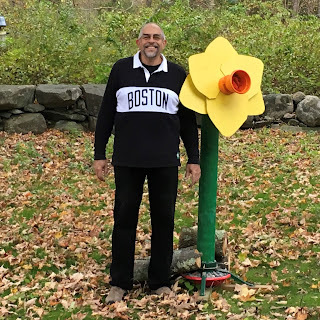 He initiated the “Trail of Flowers” concept in the fall of 2018. He had so many volunteers for the Marble Farm planting event that all he had to do was point where to dig.